Since 1916, the USDA has been guiding American nutrition. Do you remember seeing the iconic “Food for Fitness” graphic that told you how much milk, veggies, meat, and cereal to eat? Your kids might have grown up seeing the “Food Wheel” or “Food Pyramid.” Basically, researchers are always discovering new evidence that supports the different benefits of the various food groups. While these guidelines can be helpful and provide food for thought, it’s important to remember that the human body is complex and our bodies’ needs change as we grow. 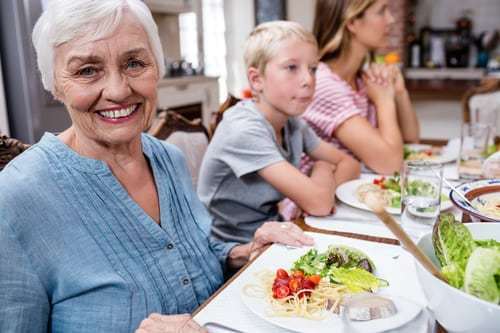 Healthy eating for aging adults looks a lot different than healthy eating for children. So as you enter your senior years, it’s important to recognize these changes and make sure you are giving your body what it needs. It’s a delicate balance, but easily achievable. As you age, it’s important to increase your intake of calcium and vitamin D. Your body needs calcium to maintain strong bones, and vitamin D helps your body absorb calcium, so make sure you care consuming enough of each. The Mayo Clinic recommends that men and women ages 71 and older consume 1,200 mg of calcium daily. You can get some of your calcium from sources like milk and dark green leafy vegetables, such as broccoli and kale. Egg yokes and fatty fish like tuna are great sources of vitamin D. Calcium and vitamin D supplements may also be beneficial, but make sure to talk with your doctor before starting any new supplements. According to the International Osteoporosis Foundation, seniors are more susceptible to calcium and vitamin D deficiencies. Experts believe one reason for this is that as you age, your appetite decreases. If you’re taking in less food, there’s a chance you’re also taking in fewer nutrients. Offset this problem by focusing on quality over quantity, and make sure the food you are consuming is packed with plenty of nutrients like calcium and vitamin D.
Unfortunately, your body begins to lose three to eight percent of its muscle mass each decade after age 30 (source). Arm your body with what it needs to combat its decreasing muscle mass: protein. With all the different protein sources, it’s important to figure out which sources are the best for you. For example, if you struggle with high cholesterol, you’ll want to focus on consuming more protein sources like nuts, white-meat poultry, eggs, and fish, rather than fatty red meat. If you’re having a hard time consuming enough protein, you can supplement your diet with protein powder. To keep your digestive system healthy, you might benefit from increasing your fiber intake as a senior. Certain prescriptions like blood pressure medication and antacids can cause constipation, but luckily fiber can work to prevent the problem. Some great sources of fiber include oats, peas, beans, apples, citrus fruits, carrots, and barley. Keep your body strong so that you can continue to feel your best and enjoy some of the best years of your life. Practice healthy eating for aging adults by increasing your intake of calcium, vitamin D, fiber, and protein. Are you looking for a relaxing place to retire near Riverview, Florida? Check out the Crossings at Riverview, located near Tampa, Florida. Our staff and trained healthcare associates work hard to help our residents stay on track with their health goals. We invite you to tour our community, meet our friendly staff, and see our amenities first-hand. Overlooking the Alafia River on twelve beautiful acres, the Crossings at Riverview offers a relaxing atmosphere, and our talented team is committed to cultivating a welcoming and vibrant community. Our goal is to make our community feel like home for all of our residents. To schedule a tour, call 813-296-6165 or contact us online. We look forward to meeting you!